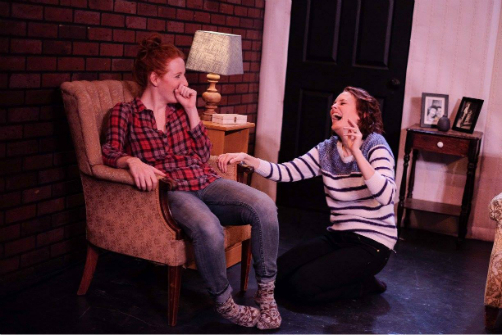 Produced by Happy Few Theatre Co.
Sarah Killough and Ellen Adair in The Goodbye Room. Photo by Happy Few Theatre Co.
BOTTOM LINE: A moving slice-of-life drama about something no one looks forward to – the death of a parent. Through moments of underplayed domestic drama, The Goodbye Room blossoms from a glimpse at a mourning family into a universal conversation about the complexities of grieving. Playing through this weekend only, The Happy Few Theatre’s The Goodbye Room written and directed by Eric Gilde is a reprieve from the common fare of overdramatic domestic dramas. The action of this 90 minute etude focuses on two sisters, their dad, and a neighborhood friend, all coming together for the funeral of the family matriarch. The cast crafts a compelling arch of grief viewed from four varying perspectives of four very down to earth, ‘every-day’ people. Among the notable accomplishments of the evening is how playwright and director Eric Gilde’s handles the topic of death. Sisters Bex (Ellen Adair) and Maggie (Sarah Killough), their father Edgar (Michael Selkirk), and Bex’s old high school beau Sebastian (Craig Wesley Divino), are all very average humans; they lead rather mundane and placid existences, punctuated by mild amusements and predictable marital or work-related disappointments. Gilde doesn’t recoil from showing us life as it really is, unglamorous and routine. Gilde’s cast all deliver commendably reserved and understated performances. As tragedy strikes, these characters don’t collapse or explode in a fanfare of fantastically frivolous emoting. Instead they are solidly real and relatable, working hard to gain perspective on what’s left of their own dwindling lives. Selkirk plays Edgar, the with tenderness and unflustered affection, and leaves a lasting impression. Warm, giving, yet direct all at once, Selkirk is a scene stealer and owns the stage a the proverbial hearth of the whole family. Divino serves up Sebastian with cherubic smugness. Boyish and effortlessly charming, Divino breaks off a delicate self-awareness in Sebastian, too. He’s a man coming to grips with the fact that maybe his best years are already behind him. Adair as the elder sister Bex and Killough as Maggie, are as natural as two siblings could be. Adair’s Bex bustles with energy while desperately masking a deep-seated penchant for brooding. It’s as if imminent despair is, always, looming just around the corner for Bex. As the play unravels, Killough helps to unburden Bex of guilt as well as some significant feelings of unrequited sisterly affection. Killough's interpretation of Maggie paints the younger sister as self-empowered yet not without a sense of constant sacrifice for her family. Through the grace of Killough and Adair’s stage chemistry, the sisters work diligently to learn how to be better siblings for each other. Bringing to life the titular place of farewell, set-designer Justin Spurtz craftily fits worn-in '70s décor into the partially unmasked theatrical venue; the effect is cozy familiarity. Tuned into the mood of the evening, Jacob Subotnick’s sound design is mercurial, following emotional threads with lovely straightforwardness. Jennifer Linn Wilcox's lighting design is strong, and it’s right on the money in a rather complicated space. Wilcox’s transitions are seamless and the final flourishes of the evening are particular stand-outs. Gilde tackles a lofty goal with this uber-realistic slice-of-life play. The Goodbye Room, above all, is warm, direct and utterly human. Even when the pace lags, as it does occasionally, or a predictable line or two on the subject of grief plops out here or there, The Goodbye Room never loses sight of the humanity of death. The Goodbye Room is Written and Directed by Eric Gilde. Lighting Design is by Jennifer Wilcox. Sound Designed is by Jacob Subotnick. Production Stage Manager is Sarah Lahue. Starring Ellen Adair, Sarah Killough, Michael Selkirk, and Craig Wesley Divino.